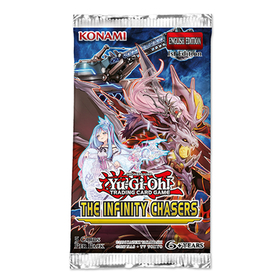 Join the quest to obtain overwhelming Duel power with The Infinity Chasers, winters 2019'a 60-card, all-foil booster set! The Infinity Chasers introduces 3 new strategies with their own unique game-play styles. The Infinity Chasers booster set contains 60 cards: 40 Super Rares and 20 Secret Rares. • Introduces 3 new strategies with their own unique game-play styles. • Entire set includes: 40 Super Rare cards and 20 Secret Rare cards. • 5 foil cards in every pack.